all swims have vehicle access, parking for disabled anglers on all swims. Wheelchair-friendly swims and Lodge. 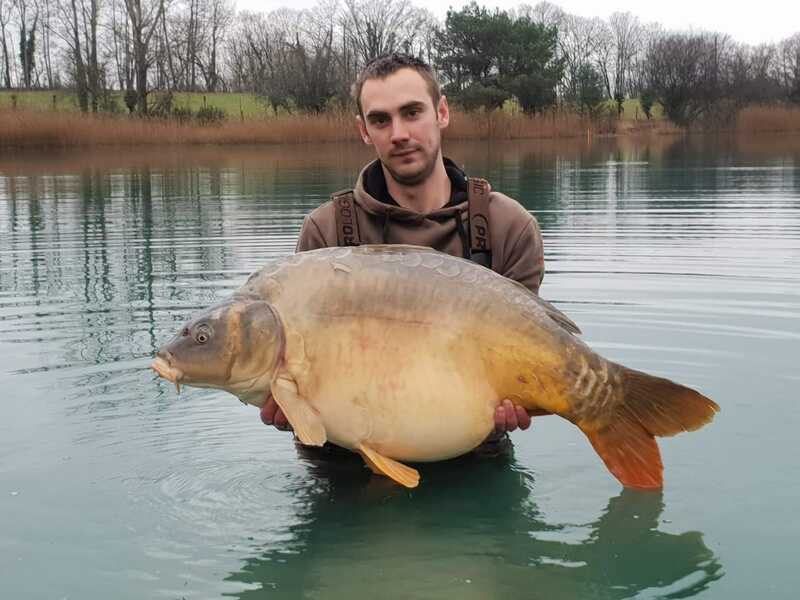 Etang de la Carpe d’Or is a new fishery that has been open since November 2015. 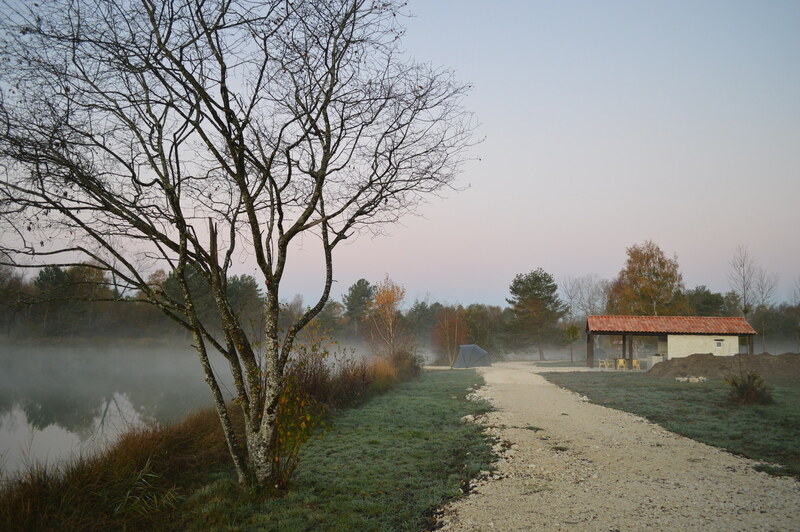 Located two minutes outside of the village of Vieux-Mareuil (24340) in the Dordogne, South-West France, Étang de la Carpe d'Or, is a spring-fed 5 hectare (12 acre) sand quarry that was abandoned and flooded in the late 1970's. To complement the existing stock (which includes 8 known fish over 20kg! 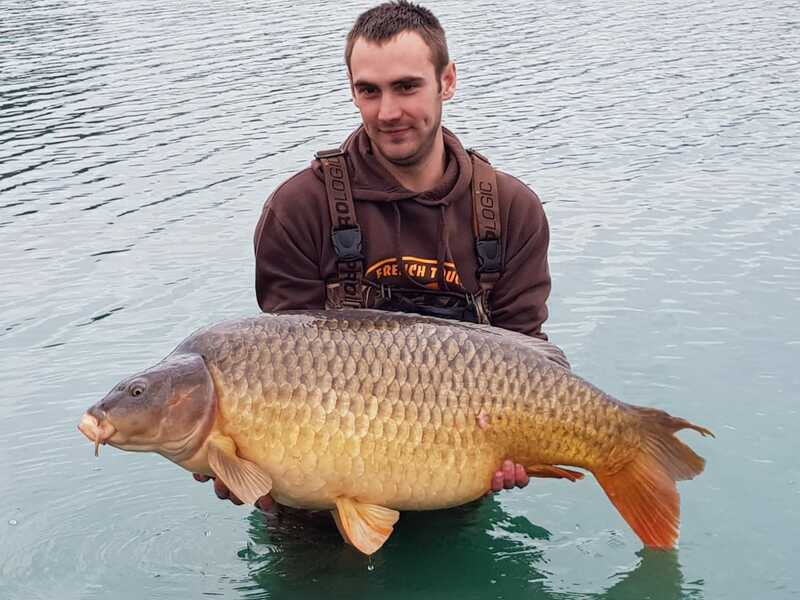 ), the owners introduced over 4 tonnes of carp, between 2kg and 30kg (including a common of over 25kgs), from March 2015 to February 2016. This included 15 plus fish to over 20kgs, a stunning 23kg mirror measuring over a meter long, and 20 stunning Koi carp! Based on 2016 catches, it is estimated that there are in the region of 400 fish in the lake, between 5kgs and, the lake record, 32.1kgs! They will be stocking several big carp (upwards of 20kgs) before the beginning of March this year (2017). Newly constructed roads allow easy access to all of the top-notch double swims, and to "The Cabin" and "The Lodge". The swims, and the Lodge and its facilities have been built to be wheelchair friendly. 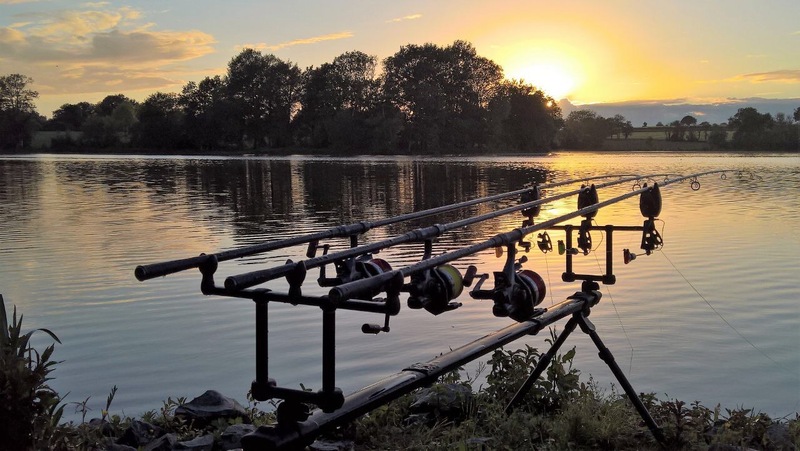 The lake itself has been left relatively untouched for now, as its natural features, such as the weed and reed beds, sunken trees, overhanging branches, and depths between 30cm to over 3.5m, have yet to be fully explored by the resident carp. 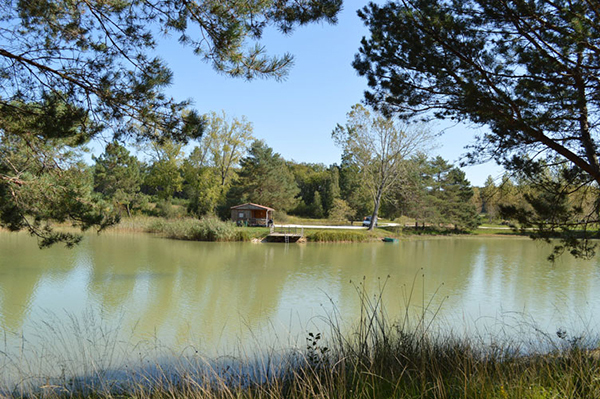 Etang de la Carpe d’Or has 4 double swims, and an almost-island Cabin swim (with accommodation) which have been placed to allow access to the whole lake, and its unusual form. Being an old sand quarry, the lake bottom is primarily sandy, with random areas of silt, weed, and gravel. Its waters are clear and blue in the winter months, and colour up slightly in the summer months. 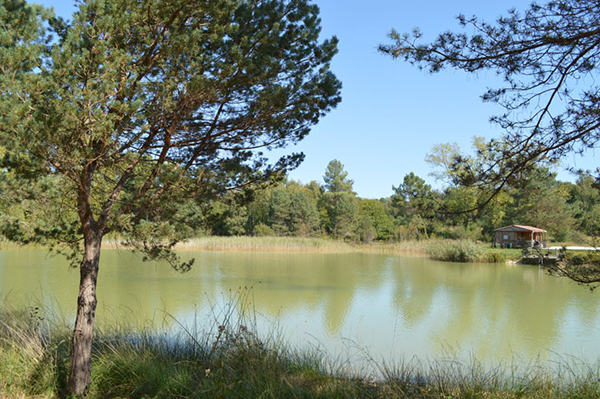 The lake experiences its higher levels in the spring, with depths of up to 3.5 meters, and this drops slightly through the summer months, due to the sunshine and hot weather that is associated with this part of France. The lake remains fishable throughout the year, with good catches still being made well into December. Boats and life jackets are provided on all swims, and can be used for all aspects of your session. Bait boats can be used and are also available to rent on-site. Nets, carp cradles, weigh slings, weigh tripods, and water buckets, provided free of charge, are the only ones be used on the site. The lake average last year was 11.2kg. This has gone down from the first year as the bigger fish, although putting on weight, have become a lot more wary and more difficult to catch. In the last year, up to March 2018 this year, a total of 12 fish from 20kg to 26.7kg were caught. A known mirror of 27kg and a new mirror of 27.5kg were also landed. 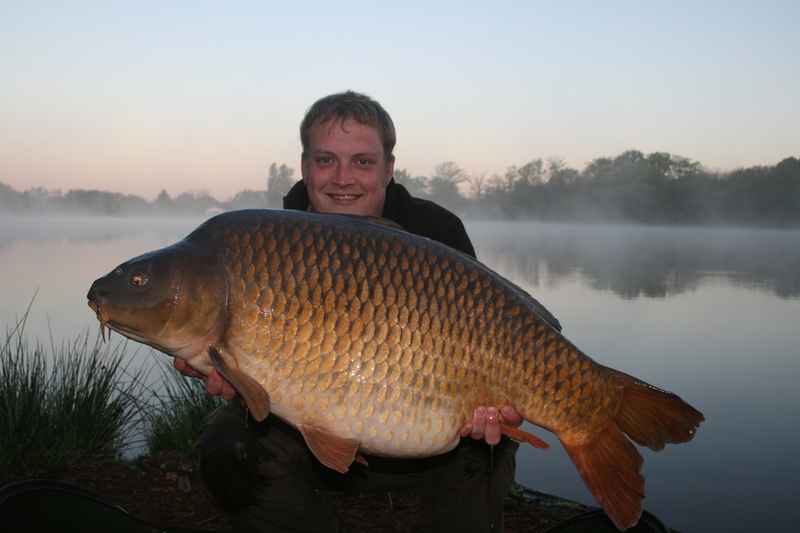 The big common and mirror (71lb / 32kg) are still swimming around, but have yet to be successfully landed. These fish mostly came out from the start of Autumn to mid-March, as we have had two exceptionally hot and dry years. Thanks to masses of recent rain, the lake is back up to its full level, and it looks promising for the new season. 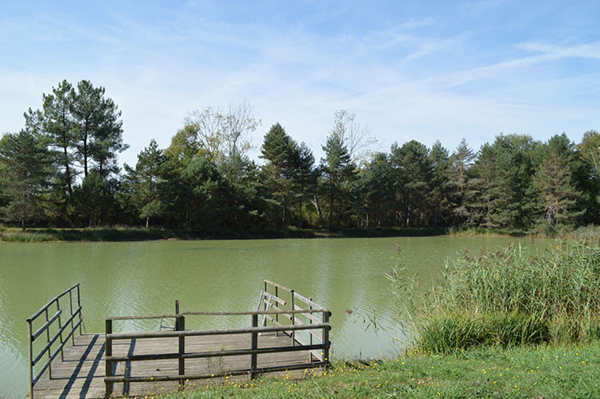 Our plan is to get the new stock pond ready for the beginning of July, to house the numerous smaller fish of 4 to 10kg, which are unfortunately still present in the main lake for now. If everything goes to plan, we will be stocking some nice big carp at the end of the year to complement our existing stock. There are 4 swims available, all of which are accessible by car for dropping off your gear. After this has been done cars are left in the car park near the entrance. Swims 1 to 3 are “traditional” double swims, which include a pre-erected large two-man bivvy. 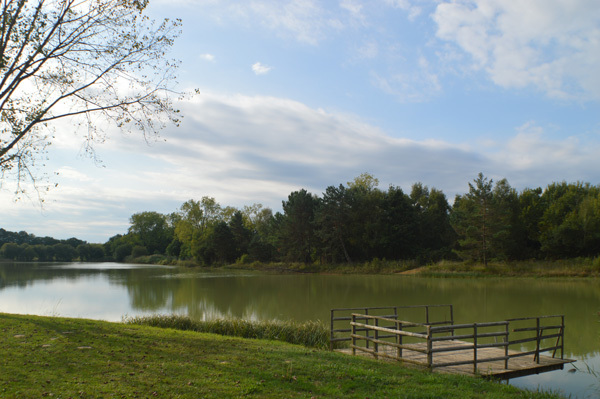 The swims are clean, flat, and mud free, and extend into the lake for maximum access and ease of use. 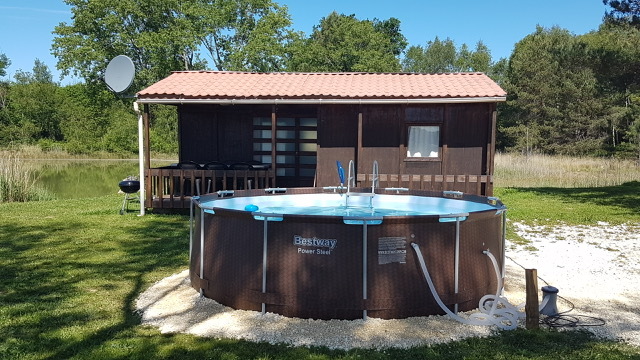 The Cabin swim, which is on an almost-island, is available for groups and families of up to 4 people (2 anglers minimum), and has comfortable accommodation and a swimming pool. The three double swims have full access to the newly-built Lodge. The Lodge has a fully equipped summer kitchen, with built-in gas BBQ, gas hob, microwave, American fridge/freezer, sink, kettle, toaster, and the all-important beer pump! Cookware, glassware, cutlery, and crockery are all provided. It's covered seating area seats up to twelve people, and is kept cool in the summer by two 140cm ceiling fans, and warm in the winter with an inbuilt table-top fire pit. It has a dedicated Wi-Fi connection, and more than enough sockets to keep all of your bankside technology fully-charged. It features a new and modern wet-room and toilet, as well as the separate ladies toilet and hand basin. It is topped off with a 50" widescreen TV, Satellite TV, and a PS3 games console. The Lodge is fully wheelchair friendly. An above-ground swimming pool is being installed for this summer. 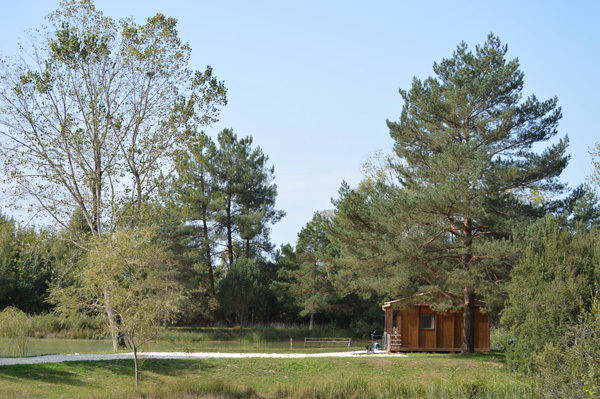 For anglers wishing to come with their families and friends, Etang de la Carpe d’Or has a dedicated swim and Cabin accommodation. 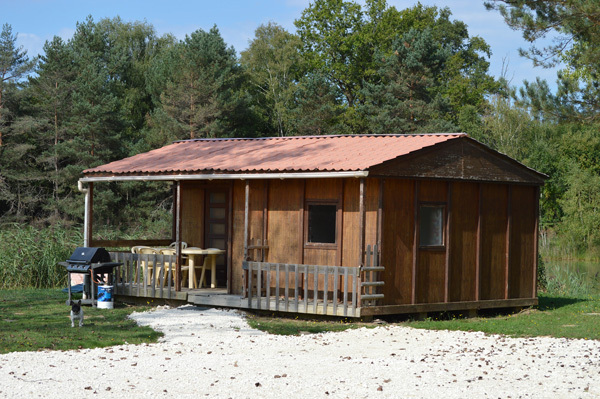 The Cabin is available for rent for a minimum of two anglers, and sleeps up to six people, four adults and two children. Bedroom 1 is the larger of the two, with a double bed and inbuilt cupboard. Bedroom 2 has 2 small beds. 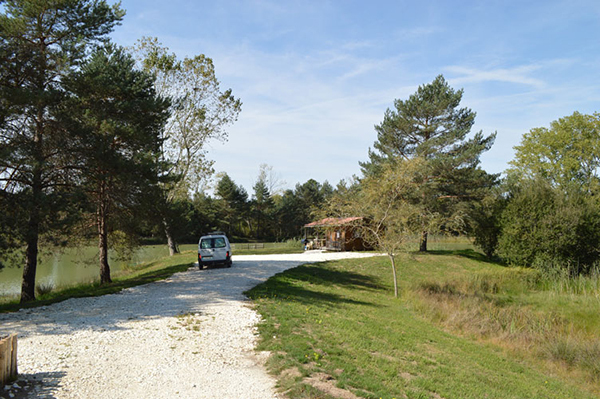 It has basic toilet and shower facilities, with the all-important flushing toilet and hot water! The kitchen is equipped with a double gas-hob, microwave, toaster, kettle, and fridge freezer, as well as all of the relevant cookware, glassware, cutlery and crockery. The "lounge" area has a widescreen TV (with integrated DVD player), Satellite TV, and PS3 games console. There is also a table and chairs indoors should the weather suddenly change! There is an outside, undercover seating and eating area, and sun loungers and cushions are provided. Linen and towels can be supplied upon request for an additional cost. The village of Mareuil-sur-Belle is only a short drive away where there are several restaurants and shops, and a new supermarket. The famous town of Brantôme (the “Venice of the Dordogne”) is a 10 minute drive away, and offers spectacular scenery, river-boat trips, a wonderful Friday market, and numerous shops selling local and regional products. The larger cities of Angouleme and Perigueux are a mere 40 minute drive away. 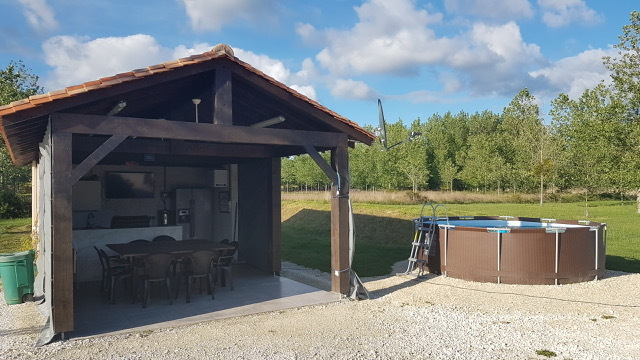 The excellent modern facilities and ease of access make Etang de la Carpe d’Or the perfect venue for those wanting to take families and non-angling partners on their trip. Carpe d'Or Carp Venue provides all nets, weigh slings, cradles & boats (with lifejackets and oars). Their use is obligatory for hygiene and safety reasons. Please do not bring your own nets or associated equipment to the lake. Bedroom 2 has a small double bed, and a bunk-bed, ideal for the kids! The toilet and shower facilities are available to all guests 24/7. Please keep these areas tidy. 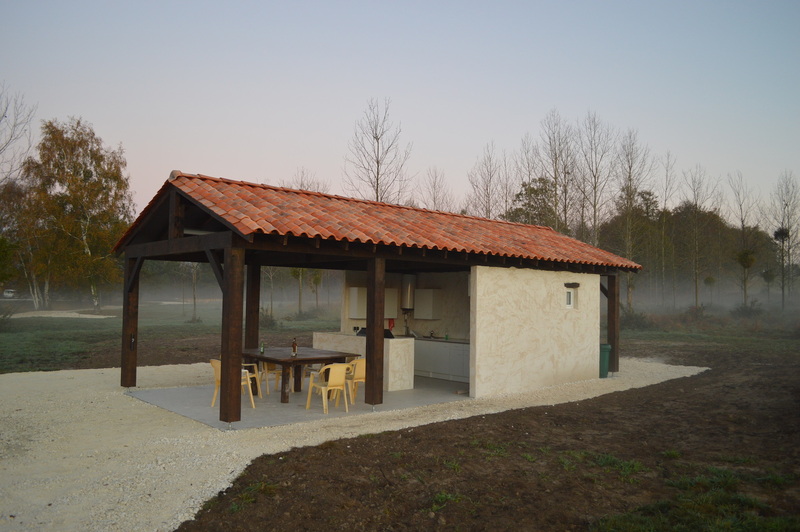 The Cabin and Lodge are provided for your comfort, and to store your food and belongings. Please ensure they remain tidy, and that they are left as you found them at the end of your stay. Guests will be charged for any damages to these areas and/or a cleaning fee if warranted. All tackle will be inspected with you upon arrival and before your departure. 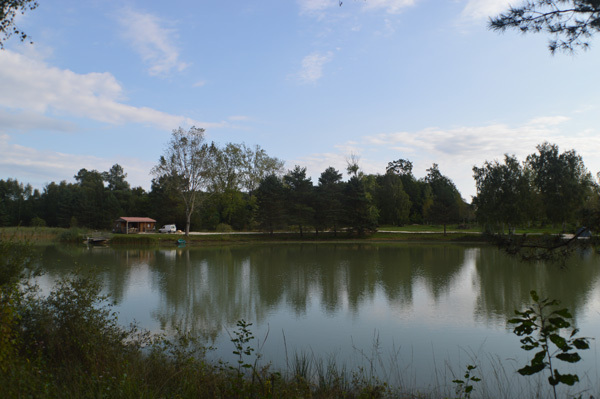 Etang de la Carpe d'Or is a fishery, not to be confused with a campsite, picnic area, etc. 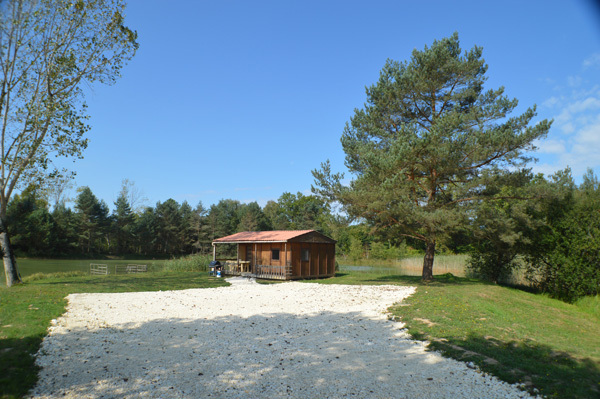 Swims and site facilities are provided for anglers and their guests ONLY. 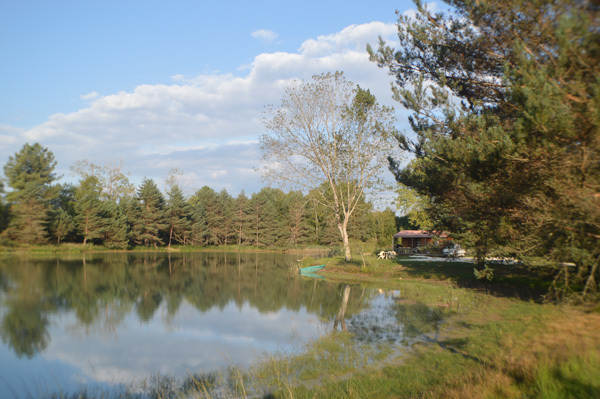 Visitors are only allowed on site with the prior consent of the owner, and MUST NOT interfere with the activity of other anglers and their guests. Rubbish bins (black for food waste, yellow for recycling, and green for glass) are provided in the Chalet and Lodge. No rubbish sacks on the swims please.